After keeping a low political profile since the June primary election, State Attorney General Jerry Brown has hit the campaign trail running for governor this week. Today, Brown was in San Diego, promoting the cause of "green jobs" and taking verbal shots at his Republican opponent, Meg Whitman. "Her jobs plan is to double the state's deficit," Brown told reporters after touring a Barrio Logan biofuels plant that recycles restaurant cooking oil and animal fats into clean-burning biodiesel. 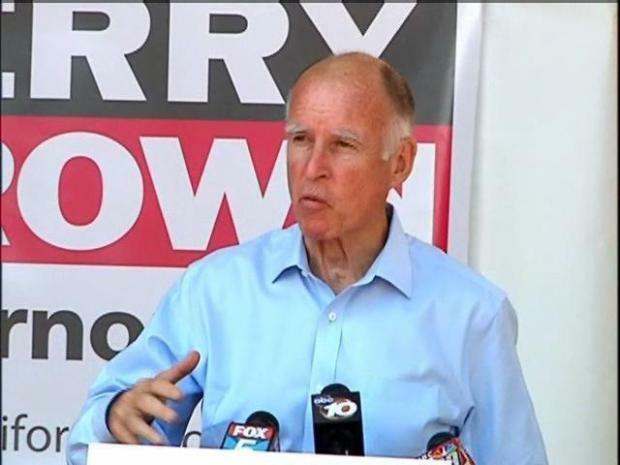 "She's proposing $17 billion in tax cuts," Brown added, "and that will devastate the schools. It will cut back money for law enforcement and fire protection, and we can't afford that at this point." From a campaign stop in the City of Industry, Whitman fired back in a satellite TV interview with NBCSanDiego. "Jerry's a good politician, but he doesn't solve the problems of California in any office that he has held," Whitman said. "The problems have mounted and not been solved. You look: As mayor of Oakland he wanted to tax everything." Brown's appearance at New Leaf Biofuels, whose customers include the Navy and the city of San Diego, was staged to tout his plan with incentives for firms to generate 20,000 megawatts of renewable energy, creating 500,000 "green" jobs. "It's the mini, small businesses that are the wave of the future," Brown said, later jabbing at Whitman's management of eBay: "I'm not someone who took $120 million as my last year's salary and had 10 percent of my work force laid off. That's the kind of insensitivy that California can't afford." Whitman, in the satellite TV interview, retorted that Brown is avoiding the issue of state pension reforms. "Jerry Brown is bought and paid for by the public unions in California," she said. "They are running his whole campaign, and they will end up paying the vast majority of the money to support his campaign right up to November." With the exception of a poll showing Whitman up by eight points -- because it counts so-called "leaners" as committed -- most recent polls have Brown slightly ahead, with one in four voters undecided. Brown said Thursday that the $104 million that Whitman has spent running for governor isn't getting great mileage. "This is basically a tied race," he said. "That's what it looks like from all the polls I've seen. And there's an onslaught -- it's carpet-bombing -- of negative commercials, and yet the people are still evenly divided." So far, only two statewide-televised debates have been scheduled, both in Northern California. Brown has called for a total of 10, but Whitman says he's ducking a proposed match-up in Fresno.